A top pressurized, batch style, 3.15 mL total volume water target with transparent viewing windows was operated on an IBA 18/9 cyclotron at 18 MeV proton energy and beam power up to 1.1 kW. Video recordings documented bubble formation and transport, and blue light from de-excitation of water molecules produced images of proton beam stopping geometry including location of the Bragg peak. Prior publications by other researchers used visualization targets to document measurements at disparate pressures, power levels, and fill volumes. This target features realistic dimensions and was operated at high pressures and beam currents consistent with recently deployed targets used for routine production. During irradiation, the proton beam excites the water molecules, producing visible blue light emissions during de-excitation. These light emissions can be recorded using a video camera in dark ambient conditions and used to observe the position of the Bragg peak and detect beam penetration. With good ambient lighting, the width of the Bragg peak and natural circulation effects are clearly visible. When a strong backlight is employed, it is possible to see and record bubble formation and transport in the target chamber. The visualization target featured an aluminum body with a 0.005” integral aluminum window and two viewing windows made of optically clear sapphire (Al2O3). 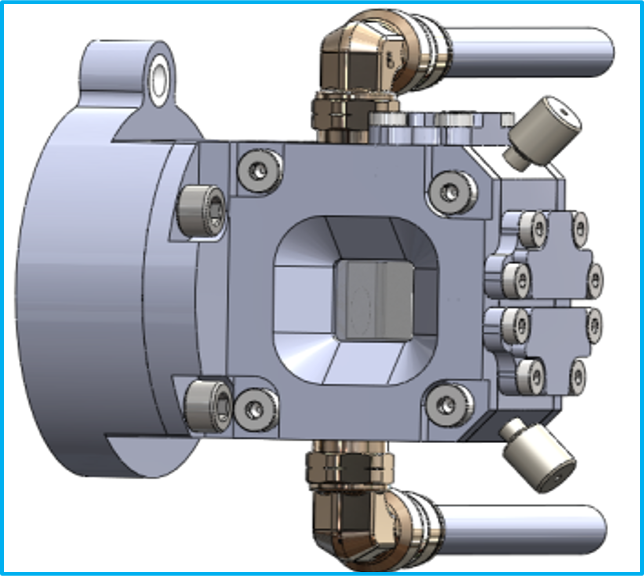 The chamber dimensions were 14 x 15 x 15 mm, for a 3.15 mL maximum volume. 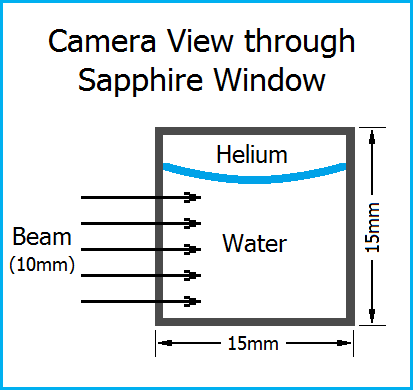 Due to the excellent physical and thermal properties of the sapphire viewing windows and the use of well-optimized water cooling, the target can be operated at typical production beam powers and operating pressures with a realistic chamber volume. Thermal performance of batch production targets was previously correlated to average void to develop performance models (Peeples 2011). 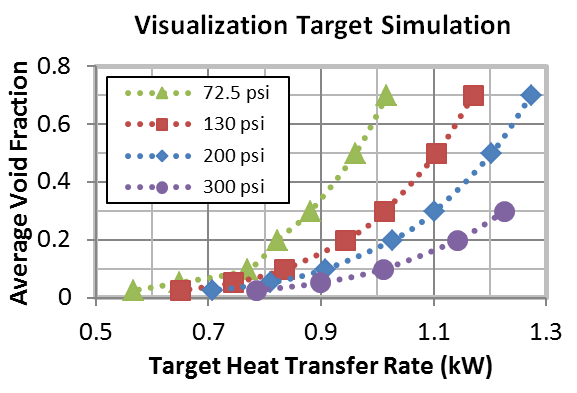 The visualization experimental results can be compared to simulations of the visualization target for the same current and pressure. The target was operated as high as 1.1 kW on an 18/9 cyclotron with a fill volume of 2.5 mL. 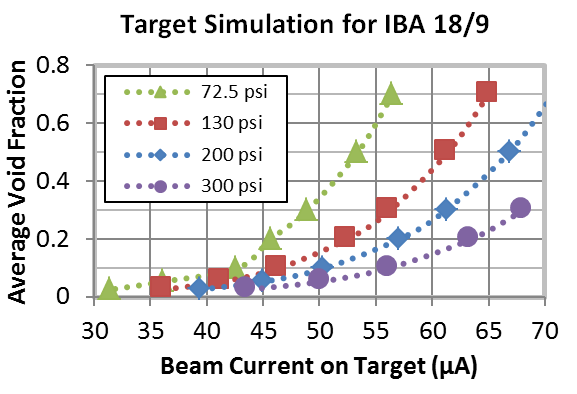 Beam collimation to 10 mm diameter, use of an extension on the beam port, and cyclotron tuning resulted in a maximum available current on target of 65µA. Stable natural convection, bubble diameter and transport as a function of operating pressure, and particle range for a variety of currents and pressures were observed and recorded. A water target with a fill volume of 2.5 mL was successfully operated at up to 1.1 kW on an IBA 18/9 cyclotron. An aggressive, circular natural convection current was visible even before the onset of boiling. Increasing the operating pressure resulted in smaller bubble diameter. Beam penetration through the helium bubble at lower fill level was observed, as was infrequent disruption of the helium bubble at high beam current. Additional experiments are planned to determine the effect of bottom pressurization on target dynamics. Additional experiments at other cyclotrons with different beam energy and distribution are also anticipated. An additional visualization target with modified chamber dimensions, which reflect current trends for higher power targets, may be constructed and tested. This work was supported by NIH grant 1RC3RR0307493-01. For additional details, please see full publication from WTTC14 here. J.L. Peeples, M.H. Stokely and J.M. Doster, Applied Radiation and Isotopes 69, 1349-1354 (2011). 2. S. Heselius, D.J. Schlyer and A.P. Wolf, Applied Radiation and Isotopes 40(8), 663-669 (1989). B.H. Hong, T.G. Yang, I.S. Jung, Y.S. Park and H.H. Cho, Nuclear Instruments and Methods in Physics Research A 655, 103-107 (2011).